Group Activities. Many of them can be modified to meet badge requirements or enjoyed as a fun activity. The programs listed below are hands-on activities and hikes that will meet requirements for some badges. Most programs will spend a portion of the program outdoors, so dress for the weather and wear good walking shoes. Discussion is tailored to fit a group’s needs and age. No badges or pins will be provided by the Park System. Please call 732-751-9453 for pricing and scheduling. Meet some of the reptiles and amphibians that might be living in your own backyard. We will see these animals in a live animal show, followed by a hike around the nature center with a naturalist guide. Get the most enjoyment out of your next hike. Review hiking safety with a Park Naturalist. Map reading, clothing, preparedness and safe hiking habits are discussed. Take a one mile hike on trails near the Environmental Center to practice our skills. What is a watershed? Learn where your drinking water comes from and how we can protect it from pollution. Watersheds and the water cycle are among the topics discussed during the program. Clean water is good for us and for the ecosystems it supports. Learn about the critters that live in the wetland and what they tell us about water quality. In this active program, we will enter a wetland and collect macro invertebrates. Using microscopes and magnifying glasses we will examine these creatures up close! Energy is all around us, but what does it cost us to collect it? Learn how energy is used and how it can be conserved. We will also see how energy is collected from the sun and the wind. What do animals need to survive? Where do they live? Why do animals become endangered or extinct? We will take a one mile hike and see different habitats along the way. Look for wildlife or signs that they live here. Learn about plants and animals in the forest and how they live together. Learn about fish and fishing laws in New Jersey. Make a home-made fishing pole. We will hike to a nice fishing spot and try our luck along the shores of the reservoir. Gain a deeper understanding of the ecosystem that surrounds us. Study animals in their natural habitat and learn about the food chains that connect these living things. Also, learn to identify poisonous plants and venomous animals. The forest around us has a story to tell. Learn about the trees that grow in our area. Identify common native trees and shrubs. How are they useful to wildlife and how are they useful to us? Examine and compare different samples of wood from around the world and see how their unique properties fit them to their uses. Identify rocks with hands-on activities. Discover common uses of minerals. 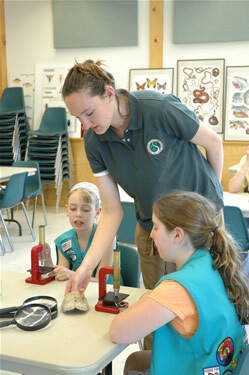 Study local fossils and learn about the geologic past of Monmouth County. Tour the reservoir in search of wildlife. The construction and use of the reservoir will be discussed. Discussion can be modified to fit relevant badge requirements. For more information or to make arrangements, please call 732-946-3758. The patch consists of six requirements designed to teach participants what their role would be as a farm worker and farm owner in the 1890s. The program includes activities to develop better understanding of the agricultural methods, daily chores, food preparation, domestic life, games and clothing styles of the time period. Please call 732-224-1367 for more information and make arrangements. Participants will learn about therapeutic horseback riding and what it feels like to live with a disability. The program includes both classroom activities and a short ride on a horse. Participants will tour the barn, learn how to groom a horse, and learn the proper techniques to lead a horse through an obstacle course. Group size: 5 min./15 max. This program explores the world of horses and horseback riding. Participants will take a tour of the barn, learn how to groom a horse, and go for a short ride with the assistance of their adult partner. Ages 5-8 with an adult partner for each participant.